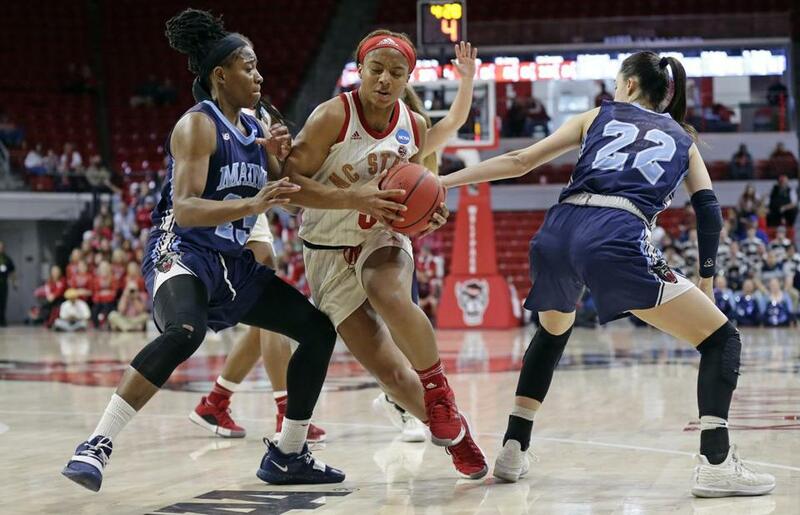 Maine&apos;s Tanesha Sutton (left) and Blanca Millan defend against North Carolina State&apos;s Kai Crutchfield during the second half of their NCAA Tournament game in Raleigh, N.C.
Kiara Leslie scored 20 points and third-seeded North Carolina State (27-5) beat Maine in a rare same-season rematch. 63-51, in the first round of the NCAA Women’s Tournament on Saturday in Raleigh, N.C.
Parise Rossignol scored 19 points with five 3-pointers and Dor Saar added 16 points and four threes for the 14th-seeded Black Bears (25-8). The two-time America East champions had their 14-game winning streak snapped. North Carolina State beat Maine, 84-46, back on Dec. 15. This time, freshman Elissa Cunane added 16 points and Kai Crutchfield had 14 points to help the Wolfpack in their first game since they lost to Louisville in the Atlantic Coast Conference tournament semifinals March 9. N.C. State will face sixth-seeded Kentucky (25-7) on Monday in the second round of the Greensboro Regional. ‘‘We just kept saying, ‘If we can get it within 10, we can make a run,’ ’’ coach Amy Vachon said. Blanca Millan, who was America East’s player of the year and averages a team-best 17.6 points, finished with just 4 points in 37 minutes. She was 2 of 12 from the field and missed all nine threes she attempted. In the two games against North Carolina State, Millan was a combined 4 of 25 overall and missed 18 of her 20 threes. South Dakota State 76, Quinnipiac 65 — Macy Miller scored 27 points and grabbed 11 rebounds to lead the sixth-seeded Jackrabbits (27-6) to their 17th straight victory in a first-round game in Syracuse, N.Y.
South Dakota State dominated on the boards, outrebounding Quinnipiac, 49-34. A jumper by Fay brought 11th-seeded Quinnipiac to within 64-61 with 2:59 to go. Miller missed a 3-pointer, but Selland grabbed the offensive rebound. Tagyn Larson missed another three, but Tylee Irwin grabbed that board. Fay then fouled Irwin, who sank two free throws to make it 66-61. A traditional 3-point play by Paige Warfel brought Quinnipiac to 69-64. Miller missed a jump shot on South Dakota State’s ensuing possession, but Irwin grabbed yet one more offensive board. Fay then fouled Miller, who proceeded to make both free throws. South Dakota State is now 23-1 when holding opponents to 70 points or fewer. Syracuse 70, Fordham 49 — After a slow start, the No. 3 seed Orange turned up the pressure, got into the flow of the game, and routed No. 14 seed Fordham in a first-round game in Syracuse, N.Y.
Three Orange (25-8) scored in double figures, led by guard Tiana Mangakahia, who had 21 points, 11 assists, and 8 rebounds. Gabrielle Cooper had 13 points on 4-of-6 shooting and forward Maeva Djaldi-Tabdi had 10 points. Mangakahia also had five steals. Kaitlyn Downey led Fordham (25-9) with 15 points. Lauren Holden and Bre Cavanaugh had 9 apiece. Mary Goulding had 8 points and 12 rebounds. ‘‘Our pressure was effective once we started making shots,’’ Syracuse coach Quentin Hillsman said. The Orange were 10 of 20 from the field and 4 of 4 from 3 in the second period. Kentucky 82, Princeton 77 — Maci Morris had 19 points in her highest-scoring game in nearly two months as the Wildcats won in Raleigh, N.C.
Taylor Murray scored 14 of her 19 points in the second half, freshman Rhyne Howard had 15 and Tatyana Wyatt finished with 12 to help sixth-seeded Kentucky (25-7) reach the second round of the Greensboro Region. The Wildcats will face third-seeded North Carolina State on Monday. Ivy League player of the year Bella Alarie finished with 20 points, 15 rebounds, and 5 assists for 11th-seeded Princeton (22-10). Gabrielle Rush added 22 points with six 3-pointers, while Sydney Jordan scored a career-high 17 points. ‘‘What you saw right there was this team in a nutshell, and the resilience of this group was on display,’’ coach Courtney Banghart said. Alarie pulled the Tigers within 73-68 with a three-point play with 3:29 remaining. Howard countered with a 3 and the Wildcats forced three straight defensive stops before Carlie Littlefield’s 3 made it 76-71 with 34.6 seconds to play. Baylor 95, Abilene Christian 38 — Kalani Brown had 17 points and 11 rebounds while playing only 18 minutes as the top-seeded Bears overwhelmed the visiting Wildcats (23-10), who were playing in their first NCAA tourney. Brown, a 6-7 senior center, had 10 of her points as Baylor (32-1) scored the game’s first 20 points. Notre Dame 92, Bethune-Cookman 50 — The top-seeded team was just too big and strong for the tournament newcomer. Arike Ogunowale scored 23 points and Jessica Shepard had a double-double in the Fighting Irish’s rout of the 16th-seeded Lady Wildcats in the opening round of the NCAA Tournament in south Bend, Ind. ‘‘I thought our posts did well with the advantage inside,’’ coach Muffet McGraw said after the Irish (31-3), champions of the Atlantic Coast Conference, won their 10th straight to move into Monday’s second round against Michigan State. The 6-foot-4-inch Shepard, who had her 15th double-double of the season by halftime, finished with 22 points and 13 rebounds, her 55th double-double in a career that started at Nebraska in 2015. ‘‘The coaches asked our guards to get the ball inside and they did a good job getting it to us,’’ Shepard said after hitting nine of 15 shots and adding four assists. Brianna Turner, a 6-3 forward who sat out last season’s NCAA title run with an ACL injury, finished with 19 points on 8-of-10 shooting, 9 rebounds, and 5 blocks. Sophomore reserve Mikayla Vaughn, who also sat out last season’s championship run with an ACL injury, had 9 points and 11 rebounds for Notre Dame, which won the board battle, 48-28, to allow the Irish transition game to dominate with 54.5-percent shooting (36 of 66) and 24 assists. Angel Golden had 25 points for the Lady Wildcats (21-11), who won the Mid-Eastern Athletic Conference Tournament and were playing in their first NCAA Tournament. Michigan State 88, Central Michigan 87 — Shay Colley’s driving layup with 7.6 seconds left lifted the No. 9 seed Spartans in South Bend, Ind. The Chippewas (25-8) had one final chance, but Micaela Kelly’s off-balance, hurried 15-footer at the buzzer was off the mark. Central Michigan had taken an 87-86 lead on Presley Hudson’s 3-pointer with 20.3 seconds remaining. The miss sent the Spartans (21-11), coached by Central Michigan alum Suzy Merchant, into Monday’s second round against top-seed Notre Dame. The quintet of scorers overcame 78 points from Central Michigan’s trio of Reyna Frost (34), Kelly (24), and Hudson (20), who earlier this season broke the school career assists record set by Merchant, a 1991 graduate. Kelly and Hudson each had five assists. Missouri State 89, DePaul 78 — Alexa Willard and Danielle Gitzen each scored 20 points as the the 11th-seeded Lady Bears (24-9) stunned the sixth-seeded Blue Demons (26-8) in Ames, Iowa. Iowa State 97, New Mexico State 61 — Bridget Carleton (23 points) led four players in double figures as the third-seeded Cyclones (26-8) routed the Aggies (26-6) in Ames, Iowa. BYU 73, Auburn 64 — Brenna Chase had 19 points, 7 assists, and 3 blocked shots as the seventh-seeded Cougars (26-6) used an impressive third quarter to run away from the Tigers (22-10) in Stanford, Calif.
Stanford 79, UC Davis 54 — Alanna Smith scored the first 9 points of the third quarter on the way to 21, as her second-seeded Cardinal (29-4) shot lights-out to beat the overmatched Aggies (25-7), the visiting Northern California neighbors who were riding a 16-game winning streak. Smith joined Maya Moore, Breanna Stewart, and Elena Delle Donne as the only players the past 20 years with 1,600 points, 200 blocked shots, and 150 made 3-pointers. Cal 92, North Carolina 72 — Kristine Anigwe extended her season-long streak of double-doubles with 18 points and 22 rebounds as the Golden Bears (20-12) rallied from a 12-point deficit in the first half to beat the Tar Heels (18-15) in Waco, Texas. Gonzaga 68, Little Rock 51 — Katie Campbell had 15 points on five 3-pointers as the fifth-seeded Bulldogs (29-4) downed the Trojans (21-10) in Corvallis, Ore.
Oregon State 80, Boise State 75 — Mikayla Pivec had 20 points and 12 rebounds and the fourth-seeded Beavers withstood a major scare in an overtime victory. Aleah Goodman added 20 points for the Beavers (25-7), while Marta Hermida had 22 points for the visiting Broncos (28-5), who were vying to become the first No. 13 seed to beat a No. 4 in seven years. Maryland 73, Radford 51 — Taylor Mikesell scored 16 points, Kaila Charles had 14 points and nine rebounds, and the third-seeded Terrapins (29-4) overpowered the visiting Highlanders (26-7). UCLA 89, Tennessee 77 — The Bruins (21-12) put a rapid end to the Lady Vols’ 38th consecutive appearance in the tournament, blunting a second-half comeback bid and using an impressive performance by Michaela Onyenwere (22 points, 15 rebounds) in College Park, Md. The Lady Vols finished 19-13, failing to reach 20 wins for the first time since 1975-76.